This story starts almost fifty years ago in a quiet top floor school lab in a leafy suburb of South East London, pouring mercury into large glass spheres. 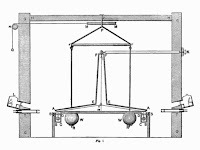 Mr Poole, our physics master, a believer in learning through doing, was instructing us on setting up the famous 1797 Henry Cavendish experiment to measure the force of gravity between masses . 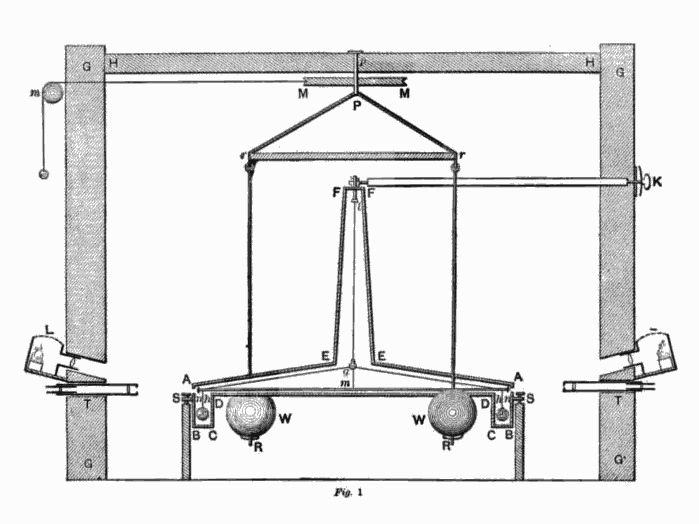 Our version of the experiment, allowed us to measure the force  reasonably accurately and from this calculate a value for the gravitational constant G .
(Cavendish had used spheres of lead weighing nearly 160 kg. However large masses of lead or lead alloy have the possibility of holes in the castings. To avoid this experimenters such as Austrian physicist Carl Braun and later our physics class used hollow spheres filled with mercury). The memory of this experiment was recalled while reading an article in a copy of New Scientist left by my daughter, who had said that she was just too busy to read the articles that week. 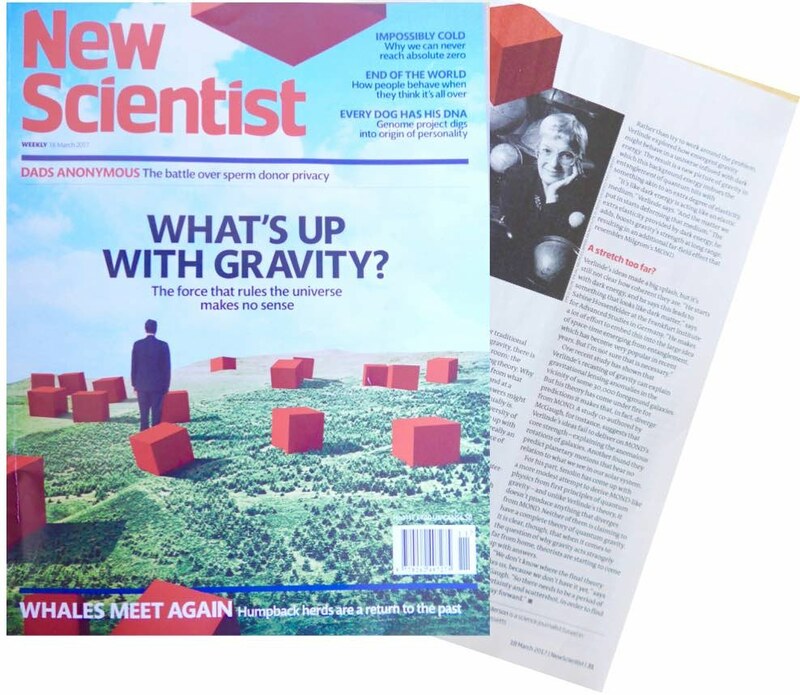 The article was entitled, “What’s Up with Gravity: The force that rules the universe makes no sense” - and "Strangely attractive", p28 - It appears online as, "Rules of attraction: Why it's time to rethink how gravity works, 15th March 2017". As a precursor to the school experiment we had already learned that bodies fell to earth with an acceleration of approximately 9.8 meters per second, per second, and that on the moon this was reduced by around a sixth (1.6 m/s/s), but how exactly this related to the mass of the planet and its diameter was quite a revelation. Recalling the experiment led me to remember that at around the same time our physics master had told us of the phenomenon of "red shift" , where the light from distant stars was shifted towards the red end of the spectrum because the stars were moving away from us, this due to the doppler effect and the lengthening of the wave length. Edwin Hubble discovered an approximate relationship between the redshifts of nebulae and the distances to them, which formed the basis for "Hubble's Law"  and theories of the expansion of the universe. (It still serves as one of the key pieces of evidence to support the Big Bang model of the universe). Mr Poole, a very good teacher, cleverly used our newly gained understanding of gravity and the expanding universe to introduce us to Einstein's 1915 theories of general relativity and of space-time and how gravity could be considered as a curving of space-time by mass . This view of gravity seemed to work well with things such as the observations made by Arthur Eddington and Frank Watson Dyson in 1919 on light from distant stars being curved by a large mass, the sun . I remembered that this first observation of light deflection by a large mass was performed by noting the change in position of stars as they passed near the Sun during a total solar eclipse. 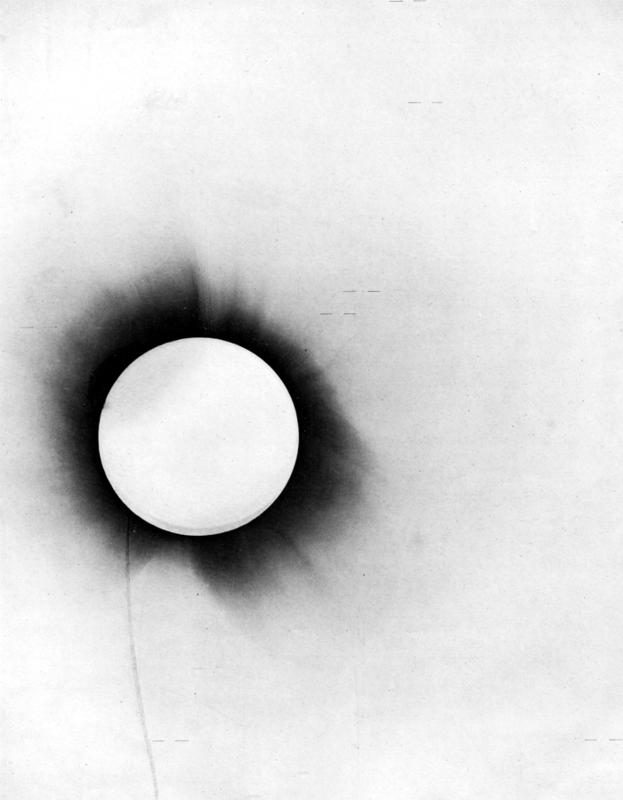 (The solar eclipse allowed the stars near the Sun to be observed). The original photographic negative they produced at the time is reproduced below with small lines showing the observed position changes of the stars. This phenomenon is now known as gravitational lensing . 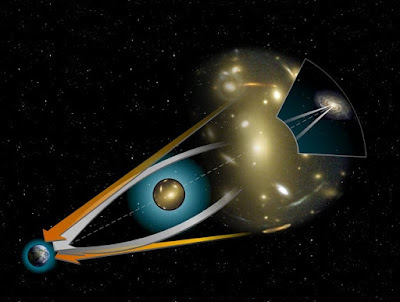 From wikimedia -An illustration of gravitational lensing. Bending light from a distant source around a massive object. The orange arrows show the apparent position of the background source. The white arrows show the path of the light from the true position of the source. But then I read the 2017 New Scientist article and even the very first paragraph alarmed me. GRAVITY is supposed to be reliable......what a shame, then, that it sometimes lets you down. "To square the whirligig rotations of galaxies and galaxy clusters with our picture of gravity, we have to invent a whole new form of matter that no one has ever seen: dark matter. To explain why the universe’s expansion is accelerating, we have to conjure up an equally mysterious essence known as dark energy". Now I had certainly heard of "dark matter" and the debate on its existence, but our universe's expansion accelerating? The "big bang" theory, that I was aware of, had assumed that over time the expansion slows, so why after around 13.8 billion years was it accelerating? Turning to Google search, I found that back in 2008 Scientific American published, "The Expanding Universe: From Slowdown to Speed Up", By Adam G. Riess, Michael S. Turner on September 23, 2008 . Then I found that in 2011 three scientists shared the Nobel Prize for physics for the discovery that the expansion of the universe is speeding up . 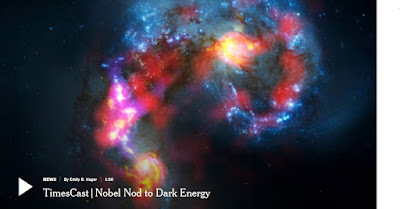 The New York Times, October 4th 2011, led with, "Three astronomers won the Nobel Prize in Physics on Tuesday for discovering that the universe is apparently being blown apart by a mysterious force that cosmologists now call dark energy, a finding that has thrown the fate of the universe and indeed the nature of physics into doubt" . While researching background for this article I noticed a new article in Scientific American which proclaimed, "Dark Matter Did Not Dominate Early Galaxies: A new study finds the mysterious substance was at most a minor constituent of large galaxies in the early universe", By Charles Q. Choi, SPACE.com on March 17, 2017 . Using the European Southern Observatory's Very Large Telescope in Chile, the researchers examined six massive, star-forming galaxies from the early universe during the peak of galaxy formation 10 billion years ago. They analyzed the rotation of these galaxies to calculate how much dark matter they possessed. 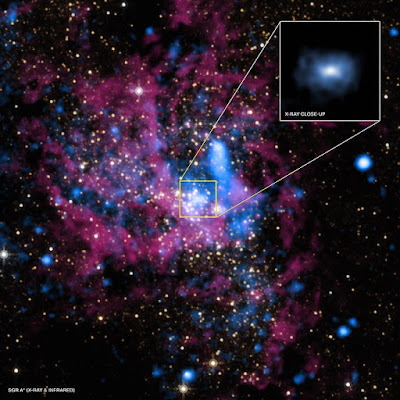 When it comes to the Milky Way and other typical galaxies born in the current era of the universe, their "effective radius"—that is, the bright region that half their light comes from — is 50 to 80 percent dark matter, said study lead author Reinhard Genzel, an astrophysicist and director of the Max Planck Institute for Extraterrestrial Physics in Garching, Germany. In comparison, in half the early galaxies the researchers studied, dark matter made up 10 percent or less of the galaxies' effective radius. 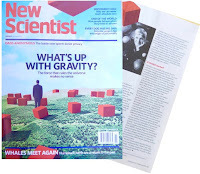 Two days earlier New Scientist, 15 March 2017, published - Dark matter took its time to wrap around early galaxies , which discussed the work of Natascha M. Förster Schreiber at the Max-Planck-Institute for extraterrestrial physics . The article explained: They found that, unlike in most modern galaxies, the stars at the edges of these early galaxies move more slowly than those closer in. “This tells us that at early stages of galaxy formation, the relative distribution of the normal matter and the dark matter was significantly different from what it is today,” says Förster Schreiber. To understand more about how space-time is curved by massive bodies, scientists are keen to study black holes more closely. 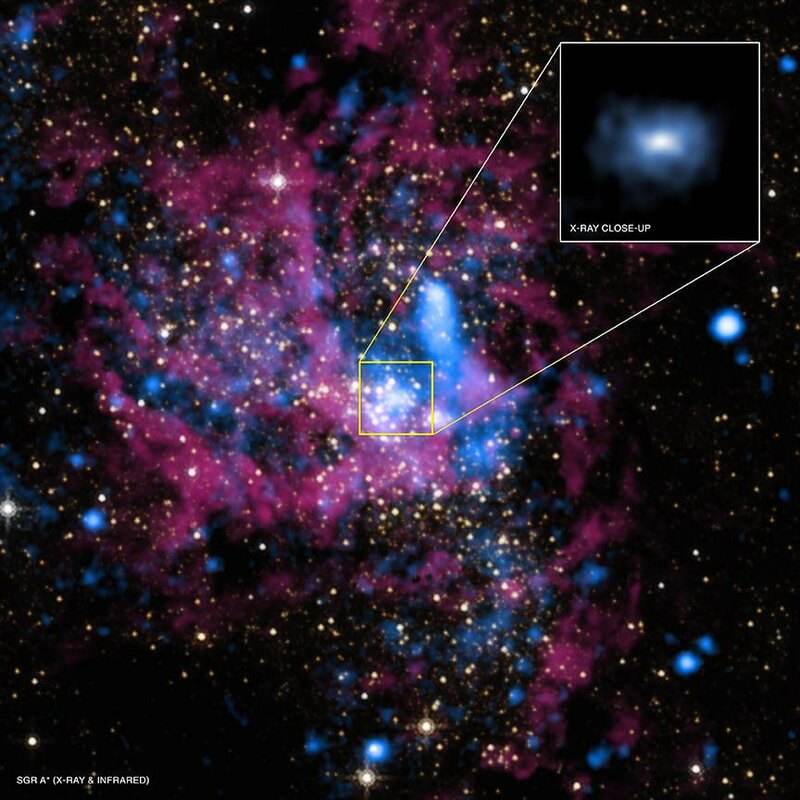 They have identified two ideal targets, firstly the black hole at the centre of our galaxy ( Sagittarius A∗ — Sgr A∗)  and secondly a much larger one in distant galaxy M87 . Sgr A* has a mass equal to around 4 million Suns, but the black hole in M87 is thought to have a mass of around 6 billion solar masses. Fig 7. 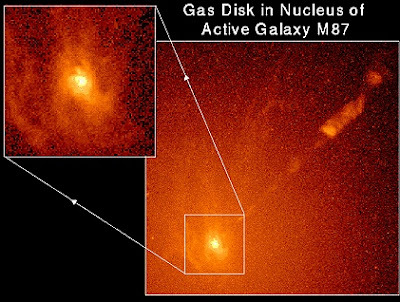 NASA Hubble image of the core of galaxy M87. Scientists believe it contains a massive black hole. In order to observe these in sufficient detail an audacious plan has been conceived which couples radio telescopes stationed across the globe to create a virtual observatory nearly as big as Earth . This is known as the Event Horizon Telescope . The experiment will commence this month (April 2017), but the data collected will be vast and analysis may well take some time. Of course while thinking about gravity and the space-time continuum we really must mention gravitational waves. Last year the Laser Interferometer Gravitational-Wave Observatory - LIGO  was able to identify a phenomenon, which until then was previous only a theory, gravitational waves . 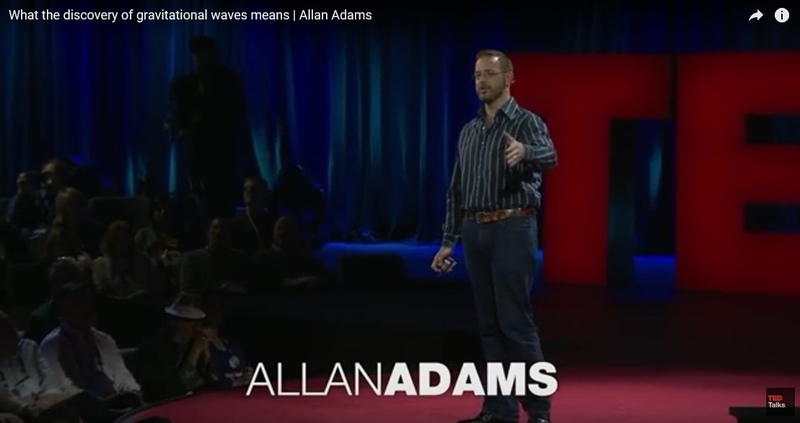 I had first encountered this phenomenon through a TED lecture by MIT's Allan Adams . Allan starts, "1.3 billion years ago in a distant distant galaxy two black holes locked into a spiral, falling inexorably towards each other and collided converting three suns worth of stuff into pure energy in a tenth of a second. For that brief moment in time the glow was brighter than all the stars in all the galaxies in all of the known universe". "In 1916, the year after the final formulation of the field equations of general relativity, Albert Einstein predicted the existence of gravitational waves". Recent theoretical progress indicates that space-time and gravity emerge together from the entanglement structure of an underlying microscopic theory. By changing the way we view gravity, namely as an emergent phenomenon in which the Einstein equations need be derived from the thermodynamics of quantum entanglement, one also has to change the way we view the evolution of the universe. And although this all sounds quite radical just a few months ago in December 2016 another paper was published, "First test of Verlinde’s theory of Emergent Gravity using Weak Gravitational Lensing measurements" . In the introduction they explain that in the past decades, astrophysicists have repeatedly found evidence that gravity on galactic and larger scales is in excess of the gravitational potential that can be explained by visible baryonic matter  within the framework of General Relativity. They conclude that: Although this ﬁrst result is quite remarkable, it is only a ﬁrst step. There is still a long way to go, for both the theoretical groundwork and observational tests, before EG ( Emergent Gravity) can be considered a fully developed and solidly tested theory. In this ﬁrst GGL ( galaxy-galaxy lensing ) study, however, EG appears to be a good parameter-free description of our observations. If a study carried out by researchers at the University of St. Andrews holds true then we may need to consider rewriting Albert Einstein’s theory of gravity. The remarkable discovery made by the team saw them locating a gigantic ring of galaxies that were travelling away from us at a rate much faster than they originally thought. Einstein’s theory of gravity may have to be rewritten, after researchers at the University of St Andrews found a gigantic ring of galaxies darting away from us much faster than predicted. This 10 million light year-wide ring made up of small galaxies is expanding rapidly like a mini Big Bang. 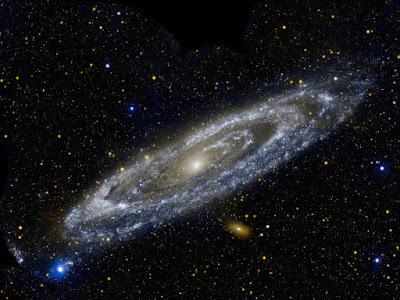 The team believe our neighbouring galaxy, Andromeda, once flew past our own Galaxy at close range , creating a sling-shot of several small galaxies. Dr Hongsheng Zhao, Reader in the School of Physics and Astronomy and co-author of the paper, published in Monthly Notices of the Royal Astronomical Society by Oxford University Press, said: “If Einstein’s Gravity were correct, our Galaxy would never come close enough to Andromeda to scatter anything that fast.” If true, the discovery would force a new understanding of gravity and about our cosmos, as such a galactic flyby only makes sense if gravity weakens more slowly as galaxies drift apart than mainstream thinking suggests. Indranil Banik, the PhD student who led the study, said: “The ring-like distribution is very peculiar. These small galaxies are like a string of raindrops flung out from a spinning umbrella. I found there is barely a 1 in 640 chance for randomly distributed galaxies to line up in the observed way. I traced their origin to a dynamical event when the Universe was only half its present age. These comments are based on a paper Published online on 13 February 2017, "Generalizing MOND to explain the missing mass in galaxy clusters" . In this work, we look at the possibility that the missing mass in galaxy clusters, which is still present in MOND, may be attributed to a modified gravity law that is a generalization of MOND. We then go on to use the data to determine if there is any empirical relation that could explain the missing mass in galaxy clusters. We find that there is such an expression, which works relatively well for this sample of clusters. The new formula has the ability to account for the missing mass in clusters by modifying the MOND formula in such a way that the gravity is boosted in regions of high gravitational potential whilst preserving the regular MOND formula in regions of weak gravitational potential. The main issue with this modified equation however, is that in regions of high acceleration and high potential, such as near a star or black hole, the enhancement of gravity calculated with the formula tends to infinity and is thus in contradiction with observation. MOND = Modified Newtonian Dynamics , Wikipedia explains this as: In physics, Modified Newtonian Dynamics (MOND) is a theory that proposes a modification of Newton's laws to account for observed properties of galaxies. Created in 1983 by Israeli physicist Mordehai Milgrom, the theory's original motivation was to explain the fact that the velocities of stars in galaxies were observed to be larger than expected based on Newtonian mechanics. We seem to be approaching some kind of breakthrough in our knowledge which will hopefully lead to a greater understanding of this fundamental natural phenomenon. Whether studying gravitational waves or the accretion disk around massive a black hole, we strive to create models that let us grasp space and time. 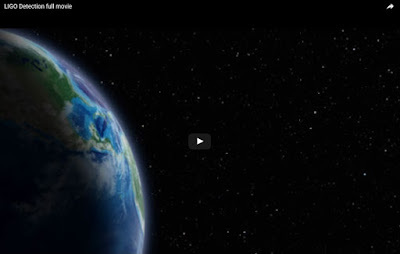 Will gravity prove to be an emergent phenomenon and will we need to rewrite Albert Einstein’s theory of gravity, those are the big questions which must be answered. However what is clear is that we are getting a lot closer to the truth, and with this truth gravity can emerge from history with its role both in the past and in the future of our universe understood.